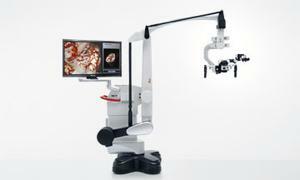 3D surgical microscope: the Leica M720 OH5 with TrueVision® smart 3D technology. Surgeons Benefit from Easy 3D Recording and Video Editing, More Space to Maneuver in the Operating Room and an Upgradable Platform for Future Surgical Guidance Applications. The first 3D surgical microscopes from Leica Microsystems with TrueVision® 3D technology inside are available to customers. By incorporating the digital smart 3D system inside select models of Leica Microsystems’ surgical microscopes, the two companies have eliminated the need for a separate 3D cart. Surgeons can control the 3D recording functions, without interrupting their workflow, via the microscope hand and foot controls, and OR staff will benefit from easier, faster setup and more space to maneuver in the operating room. The system simultaneously streams 3D and 2D video to external video monitors in the operating room or over distance. The TrueVision® 3D platform is also upgradable to support future surgical guidance applications. Leica Microsystems will be presenting two 3D microscope systems, the Leica M720 OH5 and Leica M525 OH4 with TrueVision® smart 3D inside, at the Congress of Neurological Surgeons (CNS) Annual Meeting in San Fancisco, October 19-23, 2013. Surgeons will be able to interact with the systems during CNS exhibit hours in Leica Microsystems’ booth #1237. On Monday, October 21 at 9:30 am and 12:00 pm, and Tuesday, October 22 at 12:00 pm, B. Gregory Thompson, MD (John E. McGillicuddy Professor, Neurological Surgery, University of Michigan), will present “Neurovascular Surgery in 3D”, followed by “Integrated 3D and the New App Store for Neurosurgery”, presented by Burton Tripathi, PhD (Chief Technology Officer, TrueVision Systems, Inc.) in Leica Microsystems’ exhibit theater in booth #1237.